One day, I walked into my classroom with a black envelope closed tightly. Students were very eager to know, what was inside? Then I gave them some clues like, “What is inside your mouth?” Immediately one of my students replied, “Nothing is inside my mouth mam!” Everyone started to laugh. After a few seconds, I got various responses like teeth, tongue, gums, and muscles. 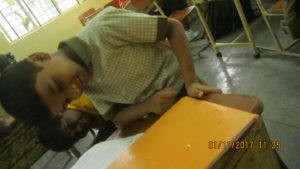 I instructed one student at each desk to open their mouth and asked their partners to observe. They noticed the missing teeth, colour and odour. They were curious to know the reason behind it. Suddenly one child said the colour and smell is because of not brushing their teeth properly. 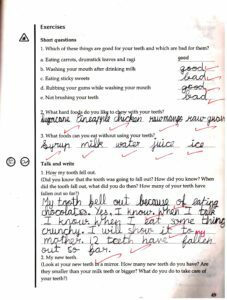 Some guessed that maybe it was due to eating too many chocolates or maybe the colour of the cool drinks which they drank remained on their teeth and tongue. During this discussion a few curious busy bees still had their attention on the black cover on the table. “What’s inside the cover?”, they wanted to know. I asked, how many of you have a tooth that is shaking? Three students raised their hands. I asked them to bring it to the class once it falls. After this hint I again asked my children to guess, “What’s inside the cover?” Each one gave a different answer, but now many of them guessed it right. Yes, It was a tooth. Everyone was interested to see the fallen tooth. 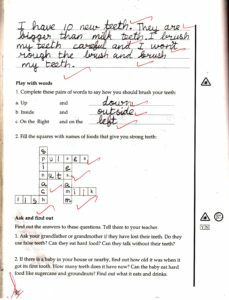 I encouraged them to observe carefully and draw it in their workbook. All this suspense and excitement lasted over the next few weeks and several students brought in their own fallen teeth, some with fresh blood on them, and drew their pictures. Students shared their experience of how their teeth fell down. 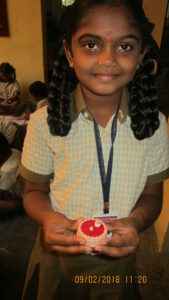 One of them recounted that she had a severe toothache and her gums were also swollen. Then the tooth started to shake and fell down within a time of two weeks. She was able to recall that she lost her first tooth at the age of 6 years, but now it was her 3rd or 4th tooth that had fallen down. Other students too responded similarly. 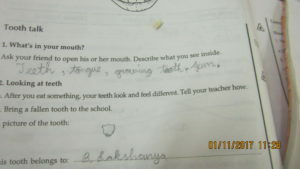 I asked the students, how did they know it was their 1st or 3rd tooth?”. 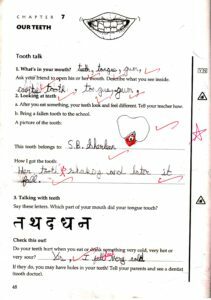 Most replied that after the first classroom discussion they had checked with their mother. While they were observing and drawing, students started to note down the size, shape and colour of the tooth. 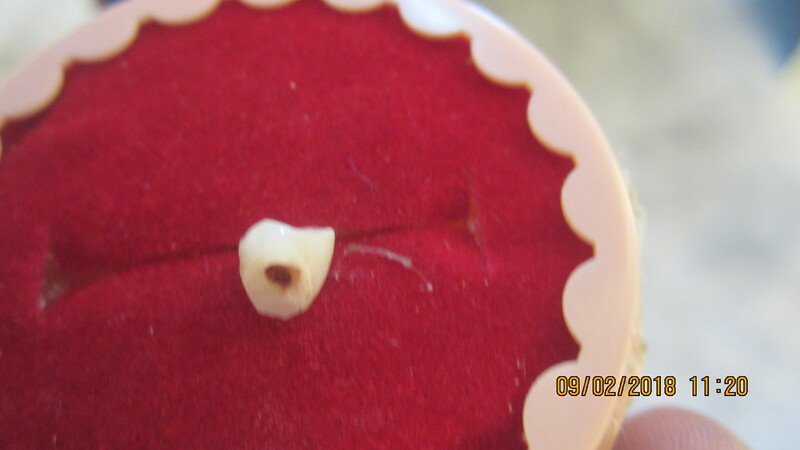 Students raised many questions about the fallen teeth like, why there is a hole at the bottom of the tooth? What is inside the hole? Why in some areas is it black in colour? Which tooth is it? Why does it fall? I told them every tooth has what they were calling a ‘hole’ in its lower (root) part where it is fixed to the jaw bone. Some of the teeth were browned or blackened with cavities too. A cavity is formed after bits of food, stuck in gaps between the teeth, decay. The germs in the decaying food produce an acid which makes a real hole in the tooth called a cavity. The tooth becomes painful and the gums get swollen. How do we prevent our teeth from getting cavities? We should not eat too many chocolates, we should gargle and rinse our mouth after every meal, we should brush our teeth twice a day. Germs can spread from one tooth to the next and make more cavities. 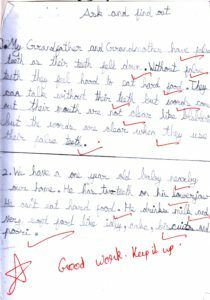 Students took a lot of interest in this topic, went home and discussed with their parents and family members, and completed their workbooks very well. 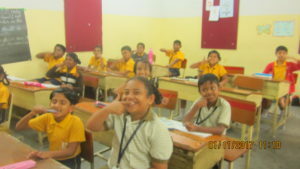 Seeing their response I went beyond the Small Science textbook and told them names of teeth like incisor, canine, molar and pre-molar, and also their functions like chewing, cutting, tearing, crushing and grinding the food. I along with teachers of other divisions showed our students some videos on the structure of tooth. It was a very enjoyable Chapter for us all.